Beggars All: Reformation And Apologetics: Luther Acknowledged His Errors on the Real Presence in the Lord's Supper? Luther Acknowledged His Errors on the Real Presence in the Lord's Supper? Here are two quotes attributed to Luther about Christ's not being present in the Sacraments. Of the Cause of the Sacrament. 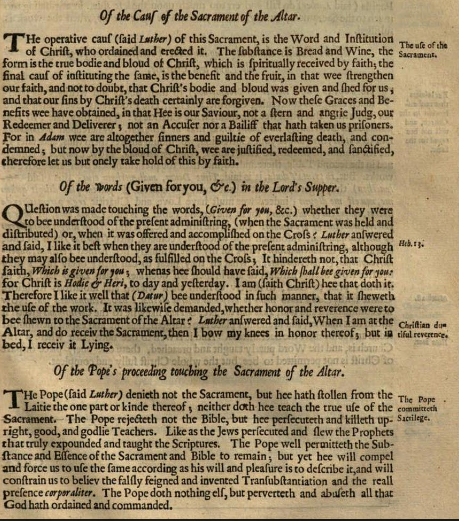 THE operative cause of this sacrament, is the Word and institution of Christ, who ordained it. The substance is bread and wine; they prefigure the true body and blood of Christ, which is spiritually received by faith; the final cause of instituting the same, is the benefit and the fruit, the strengthening of our faith, not doubting that Christ's body and blood was given and shed for us, and that our sins by Christ's death certainly are forgiven. Now these graces and benefits we have obtained, in that he is our Saviour, our Redeemer and Deliverer; For though in Adam we are altogether sinners and guilty of everlasting death, and condemned; but now, by the blood of Christ, we are justified, redeemed, and sanctified; therefore let us take hold of this by faith. Of the Pope's Proceeding touching the Sacrament. THE Pope denieth not the sacrament, but he hath stolen from the laity the one part or kind thereof; neither doth he teach the true use of the sacrament. The Pope rejecteth not the Bible, but he persecuteth and killeth upright, good, and godly teachers. Like as the Jews persecuted and slew the Prophets that truly expounded and taught the Scriptures. The Pope Well permitteth the substance and essence of the sacrament and Bible to remain: but yet he will compel and force us to use the same according to his will and pleasure, and will constrain us to believe the falsely feigned and invented Transubstantiation and the real presence. The Pope doth nothing else, but perverteth and abuseth all that God hath commanded and ordained. Besides my Lutheran readers howling "no way! ", what's going on here? Did Luther contradict his well-established view of the real presence of Christ in the sacrament? We'll see below these quotes may have been the result of one man's efforts in the seventeenth century to get a book of Luther's published in England. He appears to have added a few words to the text in order to appease the powers that be. The following is a representation of the research of Gordon Rupp from his book, The Righteousness of God (New York: The Philosophical Library, Inc., 1953), p. 76. Both of these quotes come from the Table Talk. Luther didn't write the Table Talk. It is a collection of second-hand comments written down by Luther's friends and students, published after his death. For these two quotes in the form they are in presented above, they come from the earliest English edition of Luther's Table Talk translated by Captain Henry Bell in 1652: Dris Martini Lutheri Colloquia Mensalia: Or, Dr Martin Luther's Divine Discourses at His Table, etc. The account of how Bell came across Luther's German Table Talk and had it translated into English can be found here. It is a fantastical story, almost sounding made-up. Preserved Smith's critical study of Luther's Table Talk refers to Bell's account as "such a tissue of mistakes and improbabilities that it is hardly worth serious criticism," and also, "The whole thing has the air of being invented to heighten the interest of the translation." On the contrary though, Gordon Rupp sifted through the details of Bell's story and deems it a plausible account (See Rupp. pp. 56-77). 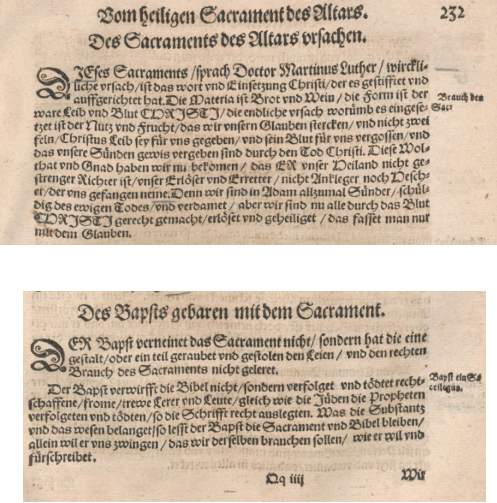 A later version of this German text can be found here (p. 305 for the first quote, p. 306 for the second) The first quote can also be found in WA TR 3:281, including a Latin version, 3354b (p. 280-281). The Latin version is attributed to being recorded by Conrad Cordatus. The second quote can be found in WA TR 3:203. But the most interesting section is the drastic abridgment by Bell of the long section in the original on "Vom Sacrament des Waren Leibs und Blutes Christi," now translated as "Of the Sacrament of the Lord's Supper." 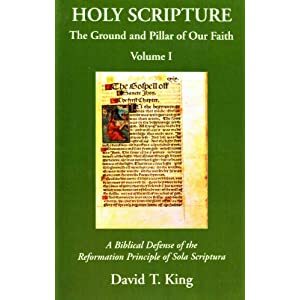 It will have been noted that the Parliamentary committee which examined Bell's book specially noted that in it Luther had acknowledged "his error which he formerly held touching the real presence corporaliter in coena domini." 1.TR. (1566) Dieses Sacraments, sprach Dr. Martinus Luther, Ursach ist Das Wort und Einsetzung Christi der es gestifftet und aufgerichtet hat. Die Materia ist Brot und Wein, die Form ist der Ware Leib und Blut Christi, die endliche ursach warurmb es eingesetzt ist der Nutz und Frucht das wir unsern Glauben starcken. 232. 2. TR. (1566). Was die Substanz und das Wesen belanget, so lasst der Bapst die Sacramente und Bibel bleiben, allein will er uns zwingen das wir derselben Brauch sollen wie er will und zuschreibet. 232. The sentence about transubstantiation and the real presence has no place in the original. Martin Luther's Colloquia Mensalia Vol. 1 (1840), p. 382-383. The Table Talk or Familiar Discourses... (Hazlitt) (1848), p. 168, 203. This also means that the actual bread and wine no longer actually exist, while the body and blood of Christ that is said to exist only looks, tastes, smells, behaves as actual bread and wine ("If you took the consecrated host to a laboratory it would be chemically shown to be bread, not human flesh" (Dwight Longenecker, "Explaining Transubstantiation"). And that this "Real Presence" only exists until the bread or wine(which no longer exist) begins to decompose The Eucharistic presence of Christ begins at the moment of the consecration and endures as long as the Eucharistic species subsist." (CCC 1377) "...that is, until the Eucharist is digested, physically destroyed, or decays by some natural process." (The Holy Eucharist BY Bernard Mulcahy, O.P., p. 32) At which point Aquinas argued that the substance of the bread and wine cannot return. And which ritual is the central supreme exalted sacrament of Catholicism though absent as such in the NT church, while God/Christ never was preached as being looking etc. like an inanimate object, but His manifest physicality ("seen with our eyes,"...) was emphasized. But since the self-proclaimed" one true Catholic church" (pick one) says it "really" Jesus Christ, then multitudes "have eaten the fruit of lies: because thou didst trust in thy way, in the multitude of thy mighty men." (Hosea 10:13) In contrast to the metaphorical understanding, which along easily conflates with John and the rest of Scripture.